The film was completed in less than 3 weeks on a budget which is equivalent to almost 3 million dollars today. 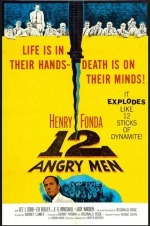 12 Angry Men hit the 28th place in a list of 50 greatest movies played by John Fonda. It was nominated for Academy Awards for Best director and best writing of adapted screenplay, but it did not win. The movie tells the story of a jury made up of 12 men given the hard job to guilt or acquit a defendant based on the reasonable doubt. The movie is 96 minutes long ant it’s filmed mostly in the jury room. Only 3 minutes of it are filmed outside of the court house. 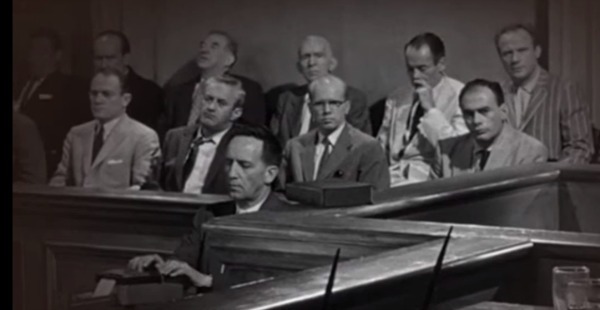 The 6 days of a long and complex case of murder in the first degree is shortened up and the real action of the movie starts with the camera catching the serious faces of the jury members when the judge states the importance of the reasonable doubt judgment. If there’s a reasonable doubt in your minds as to the guilt of the accused, reasonable doubt, then you must bring me a verdict of not guilty. If however, there is no reasonable doubt, then you must in good conscience find the accused guilty. However you decide, your verdict must be unanimous. In the event that you find the accused guilty, the bench will not entertain a recommendation for mercy. The death sentence is mandatory in this case. You are faced with a grave responsibility. Thank you, gentlemen. As the jury leaves the room a last look at the innocent faced,frightened boy defendant is taking over the camera. In the United States, a verdict made by a jury needs to be unanimous, and that is what the movie is following. 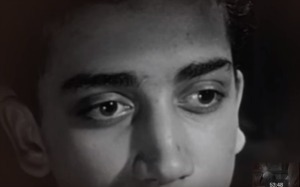 The 12 different personalities put together in the same room will add intensity and conflict in the process of deciding the faith of an eighteen years old boy who is accused of stabbing his father to death. On top of this tension, the judge informs the jury that if they will find the boy guilty, he will be sentenced to death penalty. This man’s courage and persistence in going through all the evidence will slowly force the other jurors to reconsider and review the whole case. The different occupations of the jurors and their personality will influence their action and verdict through the movie. The jury number 1, played by Martin Balsam, is a high school football coach assistant. He is somehow preoccupied with his duty as a juror, easy to influence and he proves to be helpful to others. The jury number 2, played by John Fiedler, is a wimpy bank worker who is clearly dominated by others, but as the nerves build up through the movie, his courage to change his vote also builds up. The jury number 3, played by Lee J. Cobb, is a businessman and a problem father, rude, disrespectful, stubborn and with a lot of temper bullying everyone. Juror number 4, played by E. G. Marshall, is a well-educated, well dressed, self assessed analytical wealthy stock broker concerned with facts not small talk. Juror number 5, played by Jack Klugman is somehow related to the defendants story as he also grew up in the slums. He is naïve, insecure and reserved. Juror number 6, played by Edward Binns, is a house painter, though and respectful, who experiences difficulties to make up his mind. Juror number 7, played by Jack Warden, is a sales man and a sports fan who is indifferent to deliberation because he just wants to get out of the jury room to attend a baseball game latter that evening. He is clownish and impatient. Juror number 8, played by Henry Fonda is an architect, and he is the reason for the entire movie, his vote of not guilty. He is courageous, well spoken, and concerned with another human being. Juror number 9, played by Joseph Sweeney, is a wise and observant retiree. He is the oldest one in the group, fair-minded and soft spoken. Juror number 10, played by Ed Begley, is a loudmouthed, pushy, bigot, garage owner. He is full of anger, bitterness, racism and intolerance. Juror number 11, played by George Voskovec, is a very polite naturalized American watchmaker who expresses reverence and respect for the American justice system. Juror number 12, played by Robert Webber, is an indecisive advertising executive, He is well dressed, smooth taking, superficial, who lacks deep convictions of belief system. Not surprisingly to the ages, the film was made all jurors are mostly middle aged white males, with a middle class status. The play made the jury symbolic and metaphoric as the jurors were chosen to represent a cross section of American attitude towards race, justice, and ideology. This would be an easy decision for the jury if one of them, Jury number 8 would go along with the others verdict of guilty. He will not vote guilty not because he thinks the boy is not guilty, but because he considers he needs to talk over all the evidence first. This is the moment when the first tensions appear as some of the jury members have plans for that night and just want to get over with the process as fast as possible, while others consider that people coming from the slums like the defendant are dangerous and dishonest. With all the conflict going on between the jurors, the number 8 juror still stands by his decision that all evidence presented in the case is circumstantial. He starts questioning the reliability of the witness and of the murder weapon, which is so common, that even he has one identical with the one presented in the case. After many hours of debates and no change from the other jurors, he proposes another vote session, stating that he will go along with any decision made as long as the votes are anonymous. The big surprise of the second vote is another not guilty vote raises more tension between the group. Another juror starts to question the fact that the boy would fled the scene after cleaning his knife of fingerprints but letting it behind and then coming back after 3 hours to retrieve it. Another contested evidence of one of the witnesses appears when the jurors try to test the time that would be needed to run to the door, if the witness had a stroke that limited his ability to walk. In no way, that witness could have seen the killer running out of the building. A new vote takes place and this time, the results are 6-6 guilty. This is the last drop for the juror number 3, who gets so made that he frightens juror number 8 to kill him, proving another theory that when somebody is made can speak things that he does not means. The test ran by two of the jurors to show if its possible for a short person to stab a taller person from downwards is proven inconclusive but raises more questions of the non-guiltiness of the defendant. The witness who insists that she saw the murder from the window across the street is also proven not to be reliable as she usually wares glasses but she was already in bad so she did not have the glasses on so she couldn’t see clearly what was happening across the street. At this point, another vote is made, and the result is 11-1 not guilty. The juror number 3, the only one with the guilty verdict admits that he has his personal frustration of a bad relationship with his own sun, and that is the only reason he wanted to find the defendant guilty all this time. This makes him realize that he can’t judge a person based on his own experience and he changes his vote to not guilty as well. The film end with the juries leaving the room and some of them exchanging names, but it will not give us any hint if the defendant is actually guilty or not.